It sounds like such an interesting wine. Backwards? There are so many tasting terms I don’t know how to fathom. Reads like a wine that Alice Feiring would love. Gotta wax poetic, right? Joking. Sort of…For me, ’96’s in general, are bright, some might say lean to a fault. But there is power in this wine, it’s a bit hidden. You have to coax it out, paying close attention to the development, to the genesis of the wine in your glass. Backwards is this kind of thing and honestly, this may not be the best example of it. I just try and channel the emotion, the plentitude that exists in REAL wine. My aim is to translate my feelings into words and ideas. 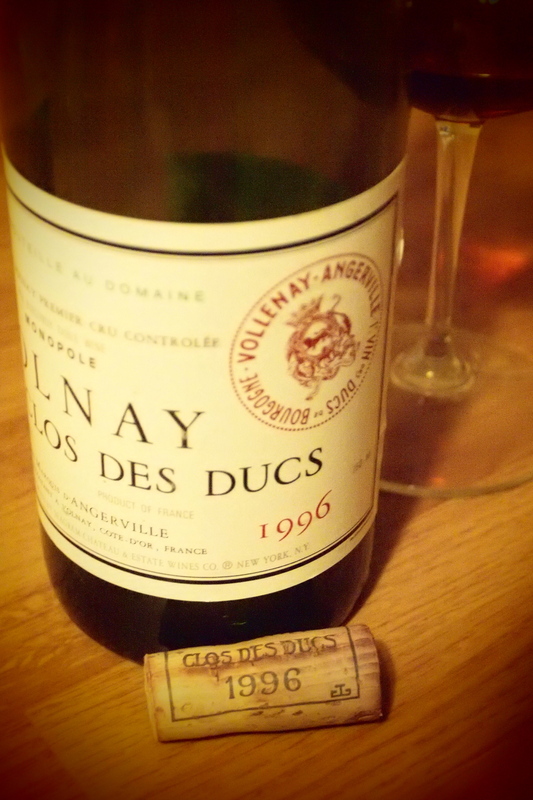 d’Angerville is one of my go to Burgundy producers. I’m not sure if Alice has ever written them up, I wouldn’t be surprised wither way. They are a value for the quality in most years, and a not-so-unknown secret. I recommend seeking them out. Cheers!